A reinvigorated movement against gun violence will take to the streets next month. NEW YORK, NY — Survivors of the latest mass school shooting aren't the only ones speaking out against gun violence. Gun-control advocates in New York City will take to the streets in Manhattan in one of several "March for Our Lives" protests across the nation on March 24. The event is being organized by local activists allied with a student movement that exploded after the Feb. 14 shooting at Marjory Stoneman Douglas High School in Parkland, Florida, where Nikolas Cruz killed 17 people and injured more than a dozen others. The New York chapter of Moms Demand Action, a pro-gun control group, is supporting the march. 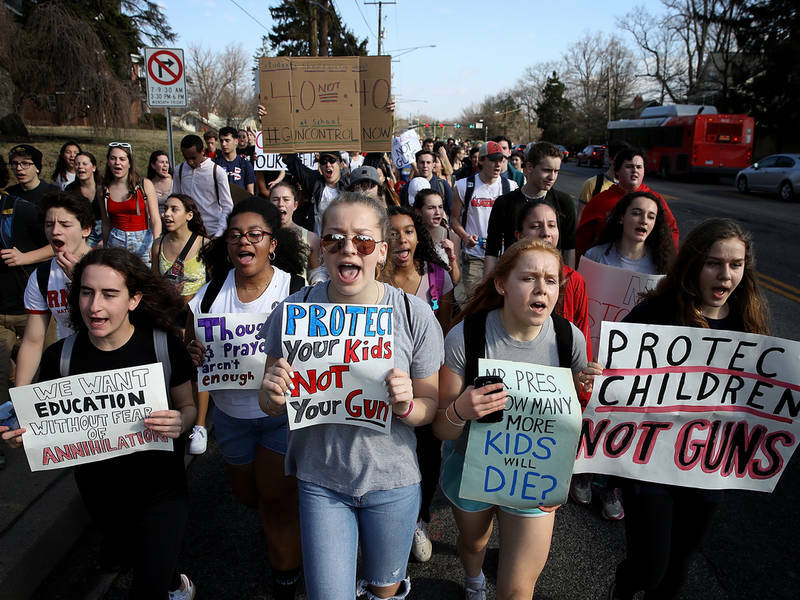 Students across the country are planning protests across the country on March 24 to demand that Congress pass stricter gun control legislation. The main event is taking place in Washington, D.C., where Stoneman Douglas students recently met with President Donald Trump. The New York City march will occur in Manhattan, though it doesn't yet have a set route, according to the official Facebook event page. Some 4,700 people say they're attending and another 12,000 are interested. "School safety is not a political issue," organizers wrote on the event page. "There cannot be two sides to doing everything in our power to ensure the lives and futures of children who are at risk of dying when they should be learning, playing, and growing." Dozens of similar marches are in the works across the U.S. Activists are also planning a nationwide student walkout on March 14, encouraging students concerned about violence to leave class for 17 minutes at 10 a.m. that day. Mayor Bill de Blasio encouraged New York City students to participate, though he said they may face "a modest form of discipline" that won't affect them in the future. Parents should send their schools a note if they approve of their kids taking part, de Blasio said. "This is too important a moment in history to try to hold back the desire of our young people to see fundamental change and to protect themselves," de Blasio said Thursday at an unrelated news conference. "They just saw their fellow young people massacred. If they watched that passively, I think they would not be actors in our society." Is This Blanket The Cure For Your Insomnia? Outstanding Essex Fells NJ Open House! Get free real-time alerts for New York City. Daily Newsletter The latest New York City news delivered to your inbox every morning. Breaking News Alerts Real-time updates on breaking stories in New York City.